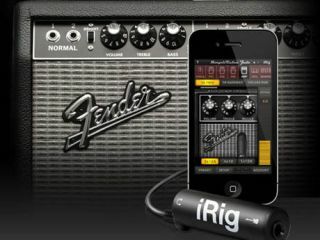 NAMM 2011 PRESS RELEASE: The new AmpliTube Fender app for iPhone/iPod touch is full-featured Fender Tone guitar rig with a built-in recording studio right in the palm of your hands. Now you can dial in your favourite Fender guitar amp and effects sounds with the new AmpliTube Fender mobile app for iPhone®/iPod touch®. With the AmpliTube Fender app, you'll always have your favourite Fender gear, right on your iPhone/iPod touch. Now you can practice, play and record with that Famous Fender tone anywhere you go. The AmpliTube Fender for iPhone app at its core is all about pure Fender tone. It was developed with careful guidance and critical tone testing from the tone gurus at Fender to ensure the authenticity of the sound. Derived from the award-winning desktop recording studio version AmpliTube Fender, you can choose from 5 Fender amp models - the '65 Deluxe Reverb™, the Super-Sonic™, the '65 Twin Reverb™, the '59 Bassman™ LTD and the Pro Junior™. Custom craft your mobile tone with 6 Fender Stompbox models - Fender Tape Echo, Compressor, the Fender Blender™, Fender Phaser,, Overdrive and Noise Filter. The AmpliTube Fender for iPhone app features a robust practising tool that allows you to import audio material, then change the tempo without affecting the pitch. You can load songs, backing tracks or loops from your iPod library on your device or from your computer, then use your guitar signal chain to practice along with the material. The SpeedTrainer feature provides the ability to slow down material (-50%) to learn complex riffs, or speed up material (+200%) to practice your playing skills. The unique AmpliTube Fender for iPhone signal chain lets build your Fender rig with 3 simultaneous stompbox effects, running into an amplifier head, speaker cabinet and microphone. Each element of your tone is individually selectable, with fully operational controls for ultimate 'tweak-ability'. Plus, current AmpliTube 2 for iPhone app users can add all of the components of AmpliTube Fender for iPhone into their current app, incorporating that famous Fender tone into their current sound. AmpliTube Fender for iPhone comes with a built-in single track recorder with re-amping ability, expandable to a full-featured 4-Track Recorder ($9.99 / €7.99) with master effects section. You can capture your ideas quickly by recording your performances then share your track by exporting high quality audio files or M4As. You can record your band, or produce full songs and compositions directly in AmpliTube Fender. The AmpliTube Fender app for iPhone costs $14.99 / €11.99. Already own the AmpliTube 2 for iPhone? No problem! AmpliTube Fender stomp box and amplifier models are available as bundled or individual in-app purchase for only $4.99 / €3.99 per amp, $2.99 / €2.39 per stomp box.